The HEPCOM platform has been developed to serve local authorities, local communities and professional practitioners, working with prevention of obesity and overweight among children and young people - for example, through healthy eating and physical activity. It can also be used by students at universities to learn about the process and methodology of health promotion projects. 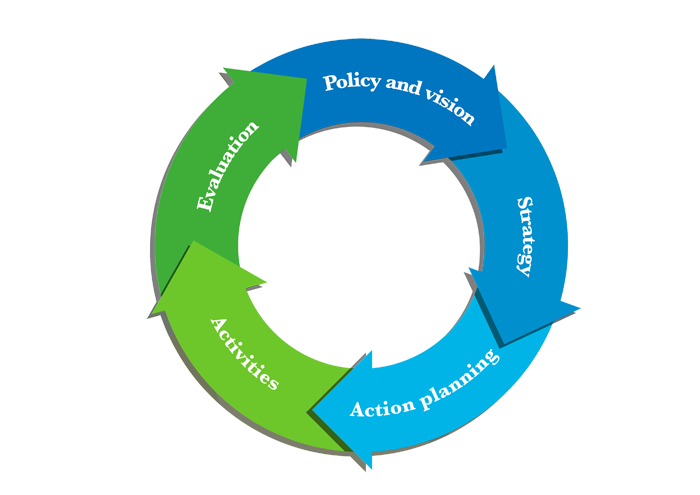 The tools in the HEPCOM platform are organized in a systematic way by applying the management cycle, which illustrates an ideal working process for the planning, development, implementation and evaluation of projects, activities or interventions. By clicking on the different phases in the management cycle, you will find tools that are related to each specific phase which can assist and inspire you to work in a more structured and informed way. The HEPCOM platform gathers tools that are developed and tested within, and from, a range of diverse health projects supported by EU funding. They are therefore sufficiently flexible to be applied within different European countries or provide inspiration to create specific local solutions based on the experiences of others. Even though some of the tools may not necessarily be recent, they are nevertheless still considered useful and relevant by the partner institutions behind HEPCOM. The platform contains good practice examples to inspire you in using the tools. National resources will also be included in the HEPCOM platform. If you click on the national section, each flag will lead you to relevant material which has been developed by your national ministries, agencies or other institutions in your country. For your information, on this website a number in an parenthesis represents the number of times the tool has been downloaded. Last updated 4 December 2018 by HEPCOM. HEPCOM project: preventing overweight and obesity among children and young people. The HEPCOM project aims to increase the number and quality of local community and school interventions for promoting healthy eating and physical activity among children and young people throughout Europe. Churchillaan 11, 3527 GV Utrecht, The Netherlands. P.O. Box 20064, 3502 LB Utrecht, The Netherlands. In these terms and conditions, “we” or “our” shall mean all or any partner(s) in the HEPCOM project. Any commercial use of the material downloaded from hepcom.org is strictly forbidden. The HEPCOM platform is offered to you conditioned on your acceptance without modification of the terms, conditions, and notices contained herein. Your use of the HEPCOM platform constitutes your agreement to all such terms, conditions, and notices. professional practitioners within local communities and schools who are involved in health promoting activities and interventions towards children and young people. You may display and, subject to any expressly stated restrictions or limitations relating to specific material, electronically copy, download and print hard copy portions of the material from the different areas of the platform solely for your own non-commercial use.